Florida Power and Light owner NextEra Energy is currently holding an open season on a new pipeline system to help supply their natural gas fired generating assets in Florida. If built, this system will be the third gas pipeline to supply Florida, which has no onshore production. 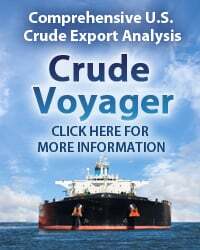 Unlike the two existing pipelines that receive most of their supplies from conventional Gulf Coast production, the third pipeline would likely be fed by shale production from the Midcontinent and Texas. Those supplies are looking for a home in the Gulf nowadays as surging Marcellus production overtakes their traditional Northeast market. Today we review the project plans. 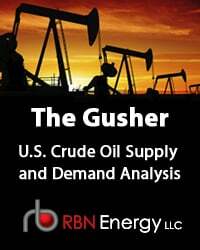 Last October (2012) we ran a series of blog posts detailing new pipeline capacity being developed in the Northeast in response to the rapidly increasing supplies of natural gas in the Appalachian/Marcellus Shale region. We initially focused on the long haul pipes with large market presence (see TGP, Spectra and Williams), and then turned to the regional pipelines (see National Fuel Gas Supply Extensions and Dominion Connections). 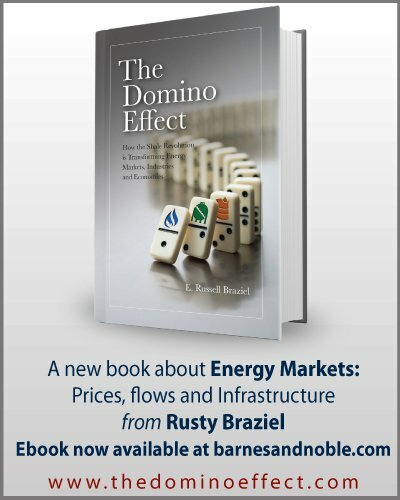 We have also covered the expansion of Marcellus and Utica gas supplies into the Midwest and Canadian markets (see Flowing Marcellus Gas into Eastern Canada, The Battle for a New Dawn and The Feeders of Lebanon). 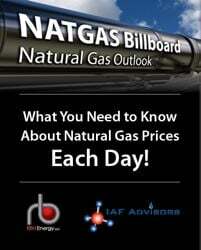 In this post we turn our attention to Florida, where growing demand for natural gas to generate electricity has resulted in proposals for a new interstate pipeline to provide additional supplies that will flow primarily from Southeast US shale gas basins. Florida uses more natural gas to generate electricity than any state except Texas, but it has minimal production and no storage capability. Two existing major pipeline systems provide natural gas to central and southern Florida - Gulfstream Natural Gas and Florida Gas Transmission (FGT). Gulfstream delivers 1.3 Bcf/d of gas from Alabama and Mississippi to central Florida via a pipeline under the Gulf of Mexico. 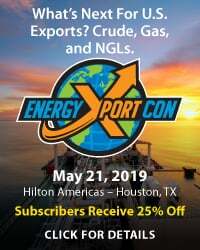 The Gulfstream system originally received supplies from offshore and onshore Gulf Coast conventional gas wells but since 2008 has been connected to supplies from the Haynesville and East Texas via the Southeast Supply Header. FGT (owned by Energy Transfer Partners) delivers another 3 Bcf/d of gas along the Florida Panhandle and down to Central Florida that mostly originates from offshore and onshore Louisiana production. Both of these pipeline systems are approaching full capacity. More than 60 percent of this natural gas supply, or 2.6 Bcf/d, is dedicated to serving electric generation needs in Florida. Florida Power and Light Company (FPL), owned by NextEra Energy is the State’s largest electric utility and the largest consumer of natural gas. FPL currently contracts more than 2 Bcf/d of gas to generate electrical power. To meet growing demand for electricity in Florida, FPL has undertaken a significant revamp of its generation fleet to replace legacy plants that burn coal and less efficient natural gas “peaker” units (see Lady Well Power for more on peaker units). FPL completed their first major plant upgrade at Cape Canaveral in April 2013 – a 1277 MW combined cycle gas turbine unit that will consume about 175 MMcf/d of natural gas. Similar additional plants are being constructed at Riviera Beach (expected online in 2014) and Port Everglades (2016). Even though these new gas generation plants are as much as 30 percent more efficient than those they replace, FPL is keen to increase supplies of natural gas to the State to provide opportunity for future growth in demand. FPL is also concerned about relying on just two pipelines that could both be subject to disruption during hurricane weather. To that end, FPL issued a request for proposals early in 2013 for new natural gas transportation capacity in Florida commencing in 2017. After evaluating the responses, FPL selected two proposals to proceed to state and interstate permitting. We look at each of these in turn below. The first proposal that FPL selected is the $3 Billion Sabal Trail Transmission project backed by a joint venture between Spectra Energy Corp and NextEra Energy. 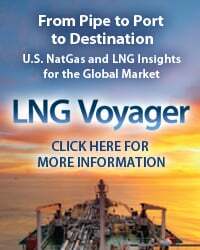 If approved by state and federal regulators, this new pipeline will originate in southwestern Alabama and transport gas to Georgia and Florida, commencing service in 2017. The pipeline will terminate at a new central Florida hub in Orlando (close to Disney World - had to get that in somewhere right?). The new hub will interconnect with the two existing natural gas pipelines that serve Florida (see map below). The Sabal Trail project will include approximately 465 miles of interstate natural gas pipeline (55 miles in Alabama, 196 miles in Georgia and 214 miles in Florida). The pipeline will be capable of transporting more than 1 Bcf/d of natural gas to serve local distribution companies, industrial users and natural gas-fired power generators in the Southeast. To access the remainder of Mickey Mouse Gas Hub in Orlando? 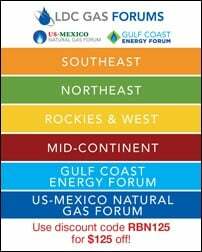 New Florida Interstate Pipelines Drive New Demand you must be logged as a RBN Backstage Pass™ subscriber.